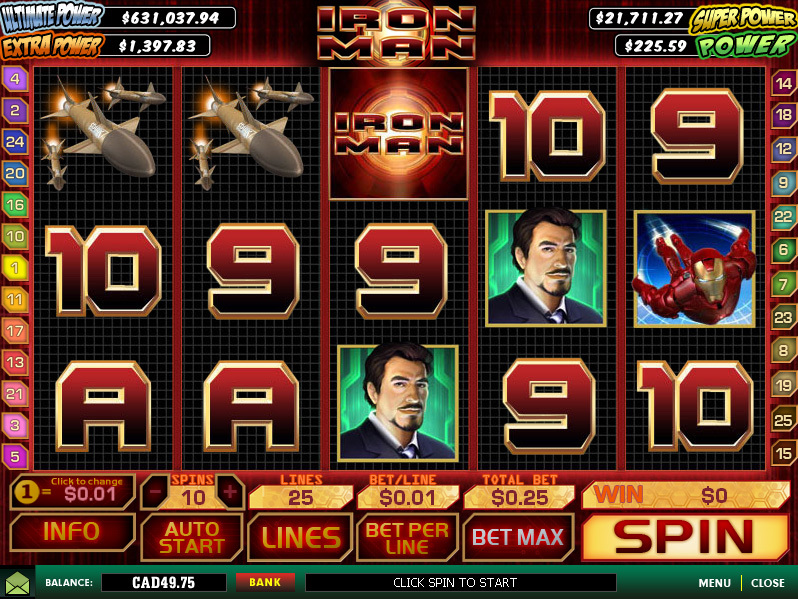 Iron Man™ is a great Playtech slot, it features 25 paylines, a bonus round that awards free spins, progressive jackpots, and an expanding wild feature. 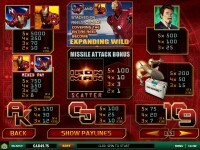 It is part of the Marvel™ Slots group that features four progressive jackpot levels that can randomly trigger at any time while you play. The bonus round is triggered when three or more scatter symbols land on the reels during a spin. You are taken to a screen where you shoot down incoming missiles. Each missile you hit awards a prize of cash, free spins, and multipliers for those free spins. 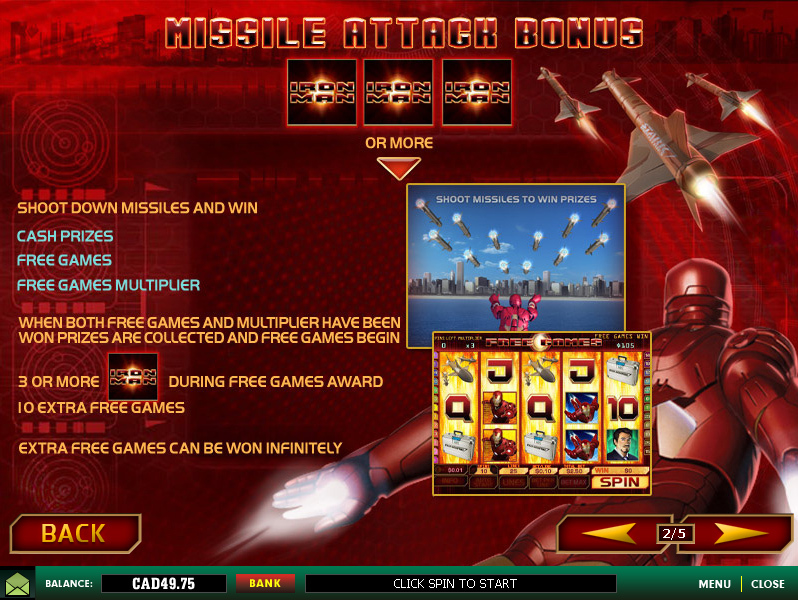 Once both free spins and a multiplier has been awarded, free spins will begin. If you hit three or more scatters during free spins, 10 extra spins are awarded. Two different Iron Man symbols are stacked on the 2nd, 3rd, and 4th reels. When a reel is full with three symbols stacked, that reel becomes wild. These two symbols can also be used together for some very good wins, just three mixed symbols left to right pay 30x your line bet, and they are stacked across the middle reels for multiple line wins. 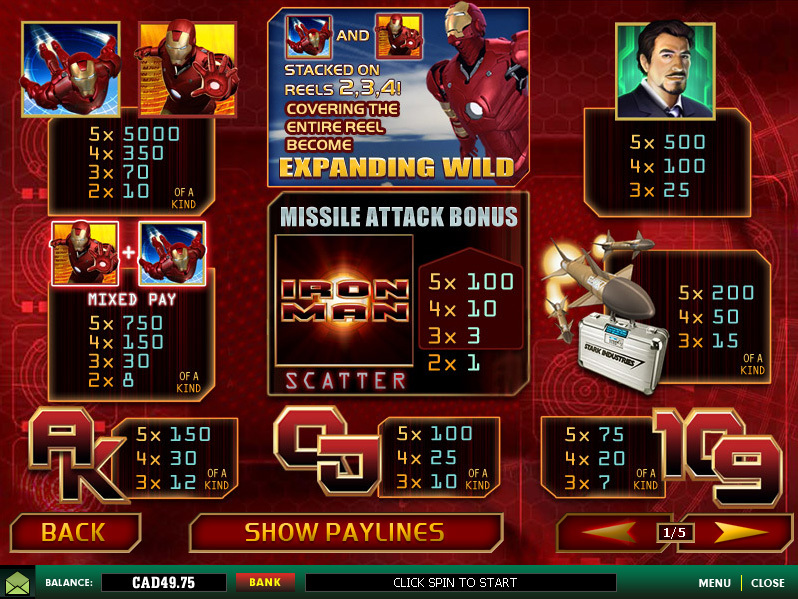 This slot is linked in to the 4 levels of Marvel progressive jackpots. Any spin of any bet size can win entry into the jackpot game, though a larger bet increases your chances of both getting to the game and winning a higher progressive jackpot. Entering the jackpot game guarantees a win of one of the four levels of progressives. You are taken to a screen with a scratch card with 20 squares, click on those squares to reveal jackpot symbols, match 3 of the same jackpot symbols to win that progressive jackpot. I’ve always had pretty good luck on this game, though I haven’t played it much since I started taking screenshots of my wins. See the screenshots below for paytable information. 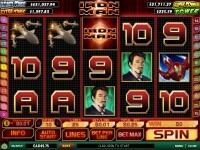 Play Iron Man, the online video slot, at any of these great Playtech Casinos.